Nothing is safe when spring fever takes hold. I go into a cleaning frenzy. The men in the house are used to it by now. After all, I organize other people for a living. My family is not immune. With my oldest son away at college, his room took a minimum of fuss. He’ll be home tomorrow for spring break, so I made a few adjustments to his room and that was that. I’m excited to have him home for a week. 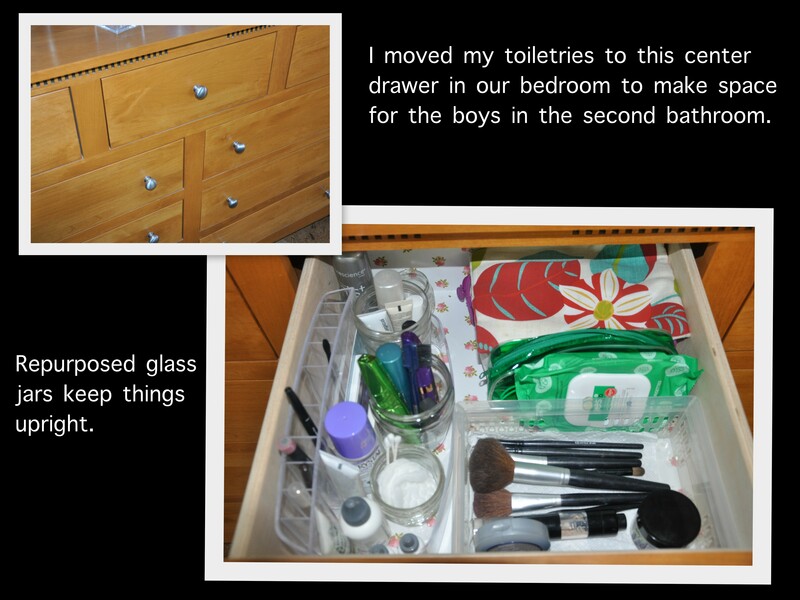 My youngest son entered his teen years and forgot all about his tidy ways. We’ve tried to negotiate (keep my door closed, he says) but I still go in there to fetch laundry and to air out the house. Clutter makes me uncomfortable. I need to work on my boundaries and he needs to work on the tidy factor. We’re both a work in progress. My husband usually dreads the annual closet sort, but this year was different. He recently lost almost twenty pounds, so he was happy to give away all the clothes that no longer fit. He looks and feels terrific. We’re on the same eating plan, but he’s lost almost twice the weight. Men. What a lucky metabolism. Once I get going, I don’t want to stop. After sorting out the clothes in our shared closet, I got out the duster and the vacuum and cleaned the mysterious cobwebs at the top of the closet, and the shoe dust below. 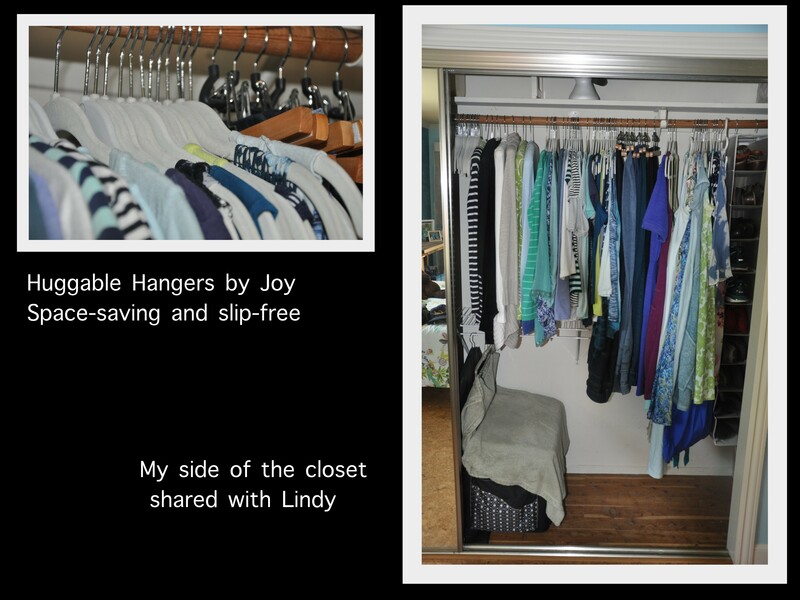 When I say “shared closet” I should also add that Lindy likes to spend her big sleep of the day in our closet. I’m storing a scrap-booking cart for my sister in there. Within days Lindy claimed it as her own. Oh my goodness though, all that fur. Here’s what I did. 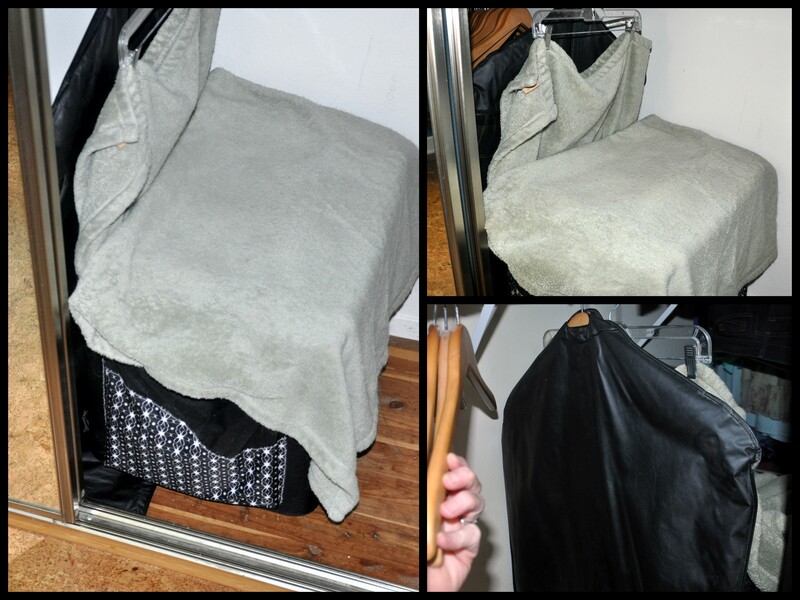 I folded a small, soft blanket to the size of the cart, then attached it at the top using a trouser hanger. It makes the spot even cozier, while helping contain the fur. It’s easy to wash and put back as well. For added measure, I hung an old vinyl suit cover, the kind that comes free with a man’s suit, on the other side to minimize the flying fluff. I should probably vacuum in there more often, but there are five million things I’d rather do. With the closets sorted, I moved on to my toiletries. I moved them into our bedroom to make more room for the boys in the hall bathroom they share. My crafting area also needed some TLC. It’s amazing the disarray one creates from making a single project. It’s all about experimenting. I’ll take out my acrylic stamps, then the stamp pads, paper and more paper, scissors, adhesive and on it goes. When I’m done, the piles in my limited space have accumulated. 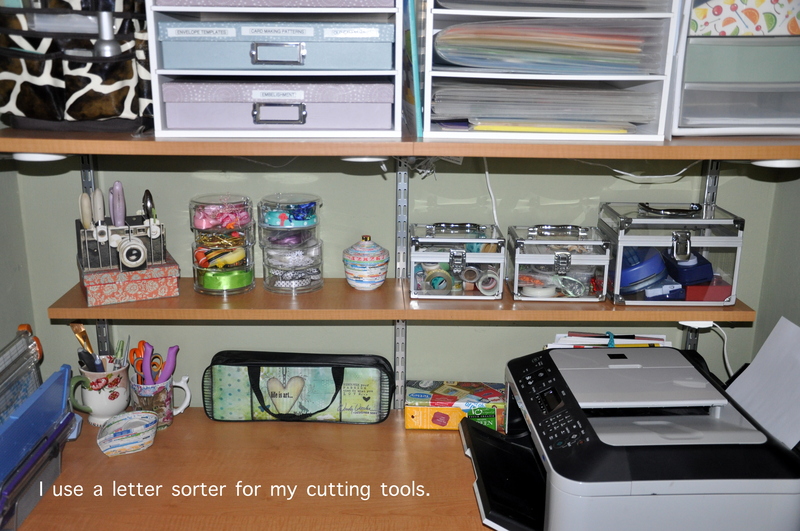 Years ago I converted the small closet in our home office into a personal crafting area, but it didn’t last long. Believe it or not, the place where I once sat now houses the cat’s litter box. 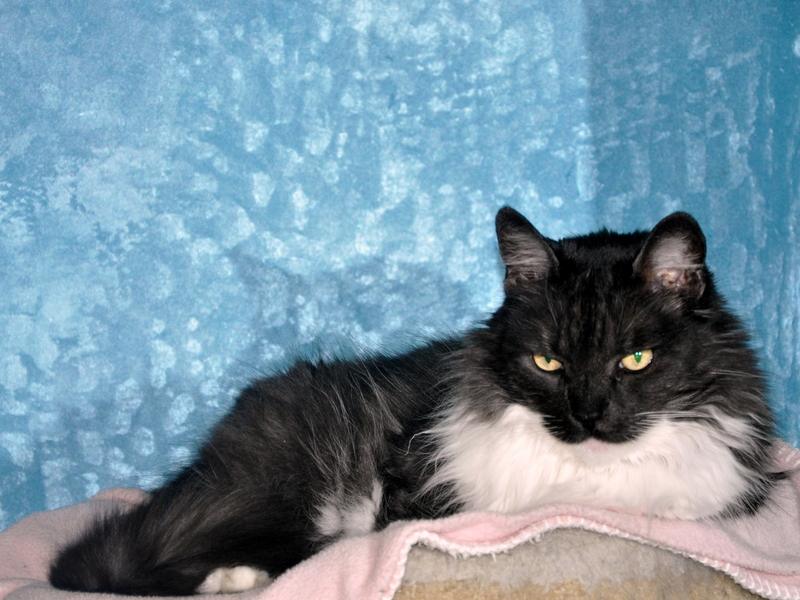 It’s a long story, but the abbreviated version is this: Slinky moved into the house but was afraid of all the other cats. This was the only place to put an out-of-the-way litter box. Soon the other two cats adopted this litter box, too. They no longer used the boxes in the bathrooms. I prefer cleaning one box over three, but I do miss the leg room. The cats run this place. 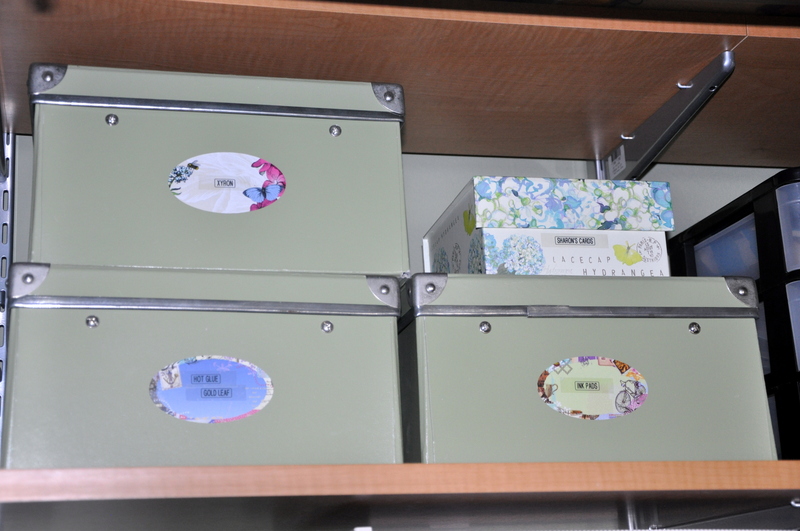 It feels great having the closets sorted, along with my crafting materials. 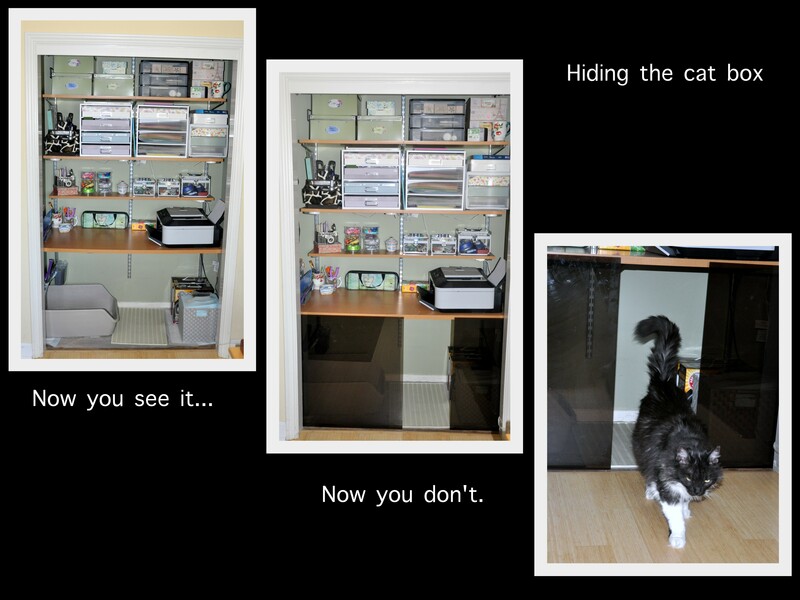 I continue to store my crafting materials in the top half of the closet, while the kitty facilities remain below. It’s all about compromise, right? I’ve been in a cleaning frenzy outdoors as we get things ready for spring planting. I’ll save those details for another post. 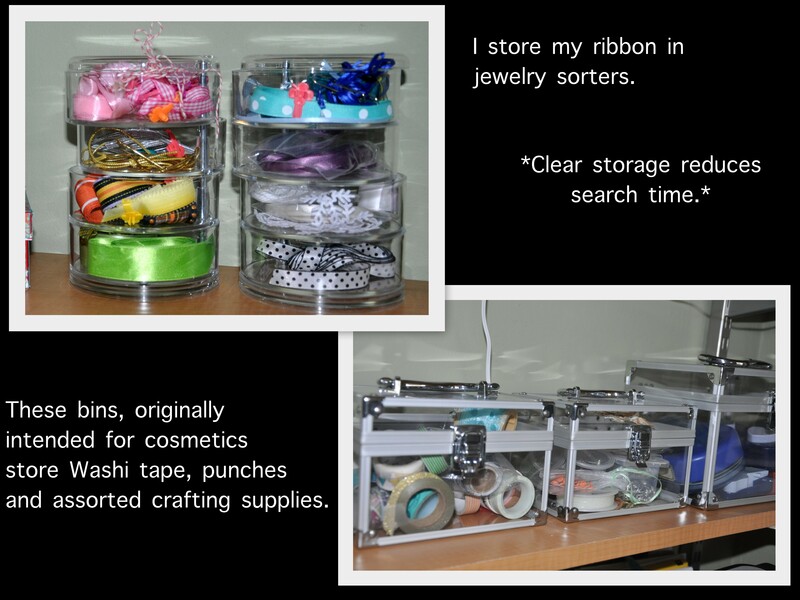 This entry was posted in Organizing and tagged huggable hangers, organized closets, Organizing, organizing cat litter, organizing cosmetics, organizing craft supplies, organizing ideas, organizing ribbon, organizing Washi tape, organzing cats, trouser hangers. Bookmark the permalink. I’m so impressed with anybody who keeps their crafting supplies in a wardrobe space. I’m complaining because I’ve lost half my craft room to a bed and I’m busy plotting ways of getting rid of the bed 🙂 I’m doing my annual autumnal clean out. For some reason there are some thing I prefer to do at this time of the year. Some of them also get done in springtime, but some of them are definitely spring cleaning jobs that have migrated. Like closet clean-outs and tidys. Living room sort outs and clear outs and move abouts. 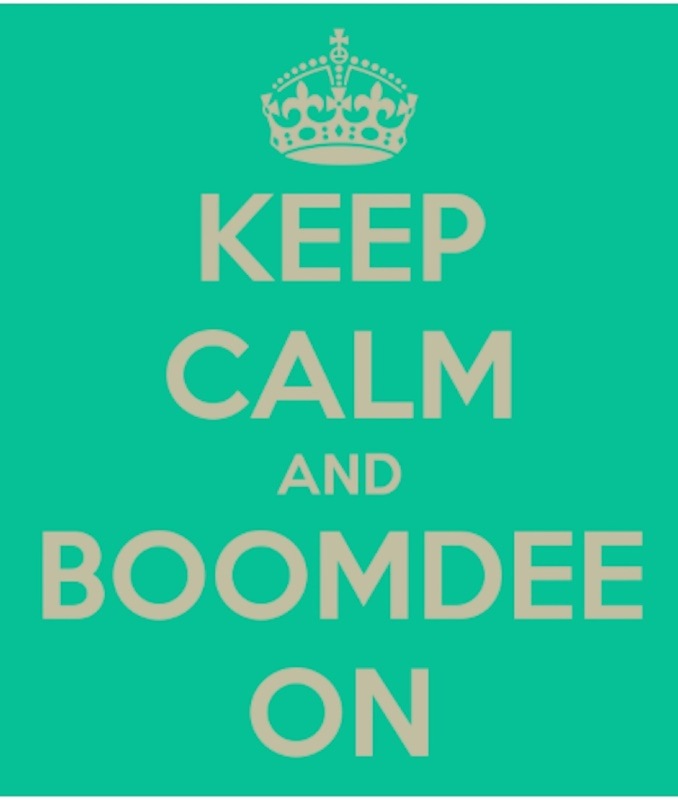 Kitchen clean outs, clean ups and rearrangings ……….. I think I like the feeling of ‘cosying in’ for the winter and having everything ready for soup making and such like – and long evenings with movies or music and handcrafts. 🙂 Sometimes I think it must be my favourite time of the year……. But I digress…. Pauline, my services are free to friends and family and what a joy it would be to hang out while doing so. 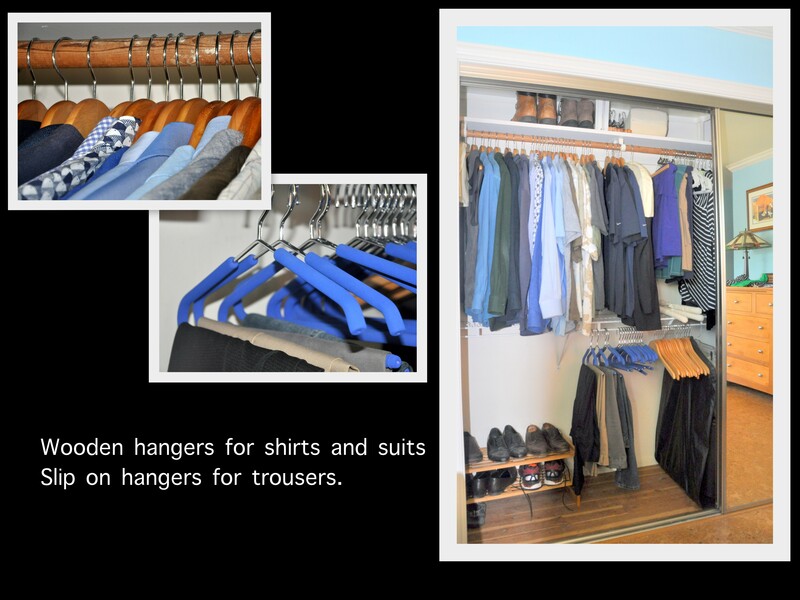 I’ve not seen your closets/wardrobes, but your place looks beautiful and organized to me. Like you, I enjoy clean outs at different times of the year. I used to do it at the start of the school year. The boys go through clothing and shoe sizes so quickly at that age, so we would start the year with the newest clothing size and pass on what no longer fit. The same with school supplies, as every teacher here would have some specific requirement. It’s hard to get mad at a puppy showing off his offerings, and probably hard not to laugh, too. Slinky has been leaving deposits in odd places of late, probably because she forgets where she is. Once under M’s desk which was really odd, and today near the back door on the door mat. I must say it’s a relief no longer having wall to wall carpet. All the messes are easy to clean up and that mats can be laundered. Our loving animals are worth every inconvenience, aren’t they, Pauline? Right now, Slinky is pain-free, has a good appetite, keeps her coat spotless and is back to sitting on my legs, so though she’s disoriented and doesn’t seem to know where she is, she’s not miserable either. I have no problem helping ease a suffering animal from this life, though it’s one of the hardest things I’ve ever had to do. It’s doing right by them. Thank you, Wilma. I’ve been enjoying your remodeling photos. Lots going on in your home as well. Thank you , Stacy. It’s a process I’ve always enjoyed. Oh my gosh, painting is perhaps the most disruptive thing in a home, topped only be redoing floors. Best of luck. I didn’t know you were planning a downsize. How exciting. When you say rental unit, is this something you plan to buy or are you giving up home-ownership entirely? I’m intrigued. I know it will all come together. I’ll be your trips out for photo excursions are a welcome break from the chaos at home. Best of luck. 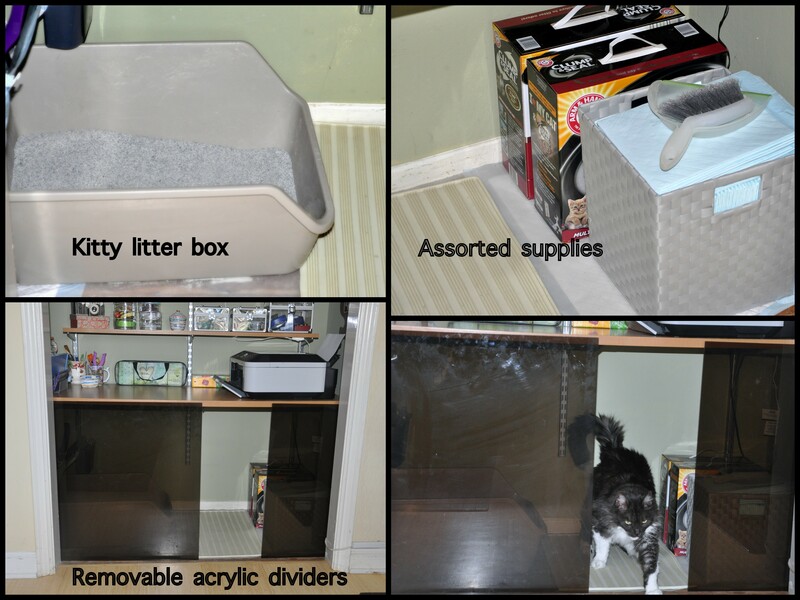 You are so organized Alys – those transparent boxes and drawers look useful. I currently need to get my time organized – if I had it my way I would be out in the garden ALL day, but today I must get some housework done! Have a great weekend, and enjoy the time with your son next week! Thank you, Cathy. I love being organized and I enjoy the process of getting there as well. I like to come up with new and improved ways of doing things, with efficiency and aesthetics in mind. I’m sorry to hear you have a day of housework ahead. Just think how good you’ll feel when it’s done. I hope a full day in the garden is in your near future. 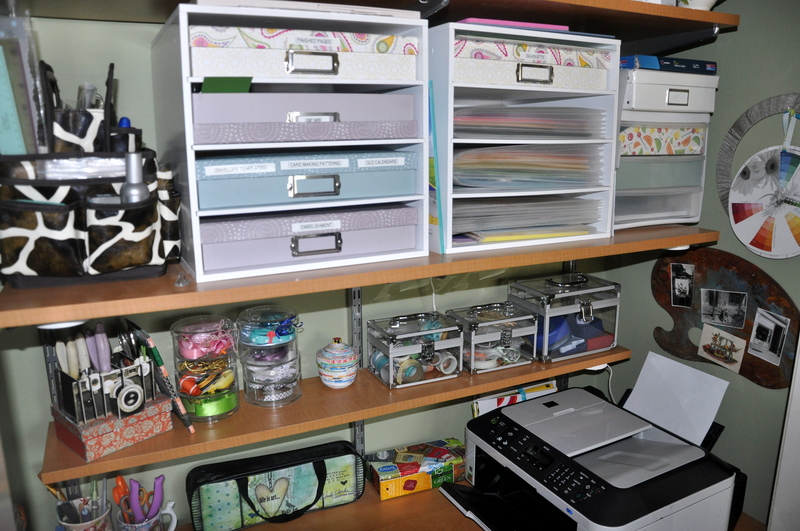 Oh my goodness, a basement-sized craft room sounds like a dream. How wonderful to have one built to order by your husband who I know is as handy as you are. I’m looking forward to that reveal. Oy. All this just makes me feel like a disorganized slob! You’re doing so well! Once we get real spring weather, maybe the mood will strike me to do some deep cleaning. But it’s snowing right now . . . The weather definitely plays a part. The other part for me is that while recovering from foot surgery, I couldn’t do much of anything. So mobility combined with spring weather and a dollop of loving the process worked for me. You must not call yourself names, Kerry. Enjoy the last of the snow. We’ll be into heat waves before you know it. Wow. I’ll get the itch soon, too, but it won’t be as big a job as you had what with crafts, cats, other folks and their clothes…It all looks great. Lisa, I remember your flat looking terrific when we were there so I’ve no doubt you’ll have cleared any cobwebs in no time. It's so dear of you to ensure Lindy has a cozy spot to snooze. You've put so much loving care into it. We have lucky kitties. I wish every kitty in the world had homes like ours. I could say the exact same thing about you. What comes out of your craft room and the hours you spend at Urban is inspiring. And your garden and home are always in top top shape, too. I do like the idea of tear away organizing tabs. Aren’t you funny. Whenever I drive by an open garage with stuff piled to the rafters, I find myself doing a mental clear out. Good thing they don’t know. I do everything last minute but kick it into warp speed, ha! Oh Jim, that’s no fun. We need that garage lined with aqua bins, STAT. Good for you for being able to let it go. I need to work on that. We’ve turned Mike’s love of cables into a family joke. It helps when you can laugh about it. He now understands that I’m uncomfortable with the clutter, so he’s able to let go of the things that don’t serve a purpose while I’ve learned to honor the things that mean something to him, even if I don’t get it. I find proper homes for them (like his high school saxophone), and find ways to store things so we can access them more efficiently. Rebellion is good for the soul. It’s true. Clutter is both a distraction and a time-waster as you spend time looking for something you’ve misplaced. Even visual clutter can feel overwhelming. We need space to breath and the ability to relax without competition from too many things. I’m at my most peaceful when the house is orderly. It allows me to relax. Wow, you are SUPER organized!!! I agree, clutter is very anxiety-inducing. I think it makes you lose motivation and focus. In a house like yours, I would have laser-focus! 🙂 I like how you neatly organize your crafting supplies so you can actually find and USE what you have! 🙂 Well done, my friend! When are you coming to Maryland and whipping my family into shape? 😉 P.S. Congrats on hubby losing a lot of weight!! You make me smile, Serena. You don’t need my help *at all*. You’re quite amazing and inspiring. I would love a visit though, and hope to meet in person one day. And I think with all your hard work and effort, that you should treat yourself to that Nordstrom’s dress.